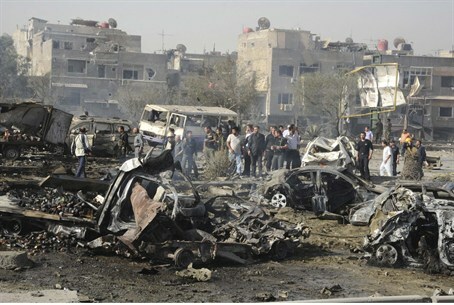 Twin blasts in Damascus on Monday killed 55 and wounded 372 during morning rush our, state television reported saying most of the victims were civilians. “Two explosions caused by terrorists took place on the freeway in the south of Damascus as people were heading to work and children to school,” the report said. The blasts took place in front of a security building used by Syria's pervasive secret police services, the AFP reported from the scene. The facade of the building was destroyed along with several surrounding residential buildings. Television showed gruesome images, including the charred hand of a woman on a steering wheel, her gold bracelets dangling from her wrist. Other burnt and mangled bodies lay in the street amid the burnt out bodies of smoldering vehicles. A crater three meters wide was caused by one of the explosions, the AFP correspondent reported. Major General Robert Mood, chief of a UN observer mission in Syria, reportedly visited the site to survey the aftermath. Ten Syrian soldiers escorting them were hurt in Wednesday's bombing, according to the Associated Press. Mood said that attack was “a graphic example of violence that the Syrian people” were suffering on a daily basis. The blasts come despite a UN-backed ceasefire that went into effect on April 12 with the aim of ending President Bashar al-Assad's brutal 14-months crackdown on a popular uprising that has blossomed into armed insurrection. The British-based Syrian Observatory for Human Rights said Thursday's explosions were the result of a car bomb targeting an intelligence services base in Damascus. A deadly suicide bombing at Zein al-Abidin mosque in the capital's central Midan district on April 27 killed 11 people and wounded dozens. Damascus has been the target of several bombings in past months as al-Assad's forces fail to curtail the movements of a growing armed rebellion by the Free Syrian Army. However, analysts question whether the FSA is behind the bombing campaign, noting the lightly armed bands of Syrian army defectors are poorly organized and primarily focus on hit-and-run raids and ambushes. UN officials place the death toll in Assad's brutal crackdown at "more than 9,000," but admit they stopped counting months ago due to the chaotic situation on the ground. The Observatory places the death toll at almost 12,000 – most of them civilians – saying at least 800 have been killed since April 12.